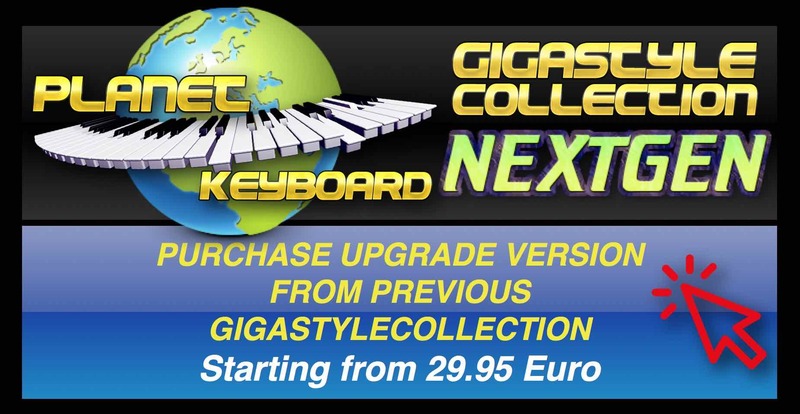 The NEW GIGASTYLECOLLECTION NEXTGEN is here ! Available for Yamaha – Roland – Ketron – Solton – Technics – Wersi – Orla – Bohm – Casio – Kawai keyboards. Available for MAC or PC. 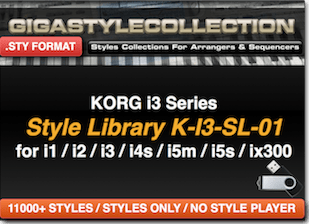 Thousands of keyboard styles for your instrument bundled with a Style Player software full of new features. 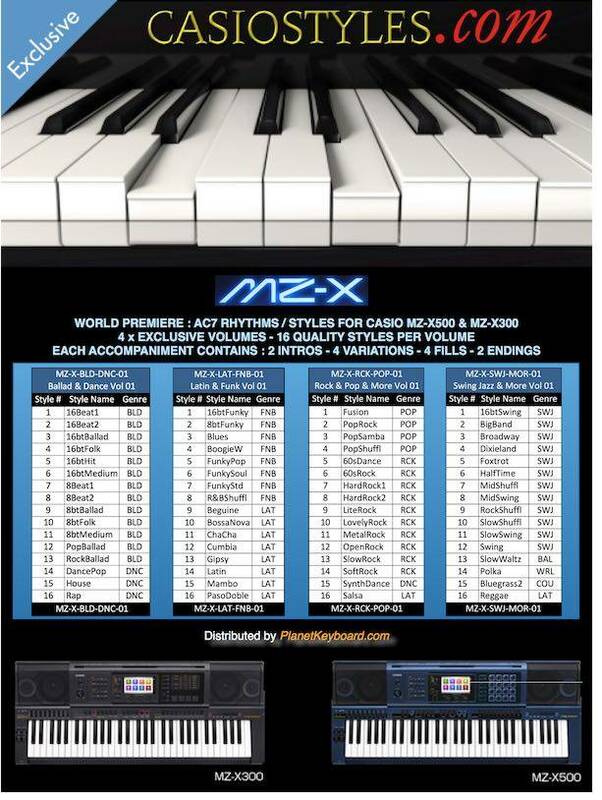 we have styles, rhythms, accompaniments or patterns for the vast majority of the digital keyboards on the market. You have an old keyboard ? A recent one ? An entry level keyboard or a very high end Keyboard ? We have superb styles to extend your keyboard stylistic palette. 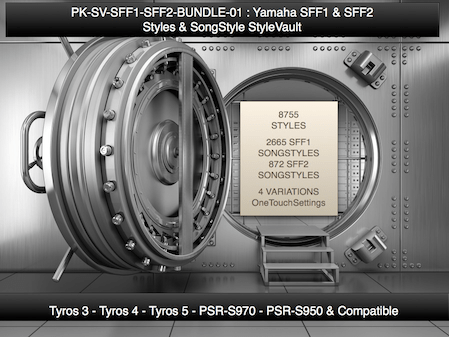 We also have “Song Styles”, which are styles inspired from renowned international songs which will free you instrument. 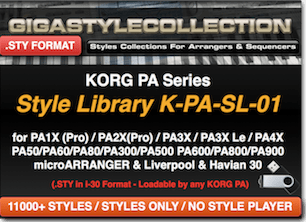 1996 – Worldwide Exclusive Development of new PCM cards “Synth Legends” for Korg keyboards 01W Series / X Series / Wavestation SR with the support of Korg Inc Japan. 2017 – Many more news to come ! 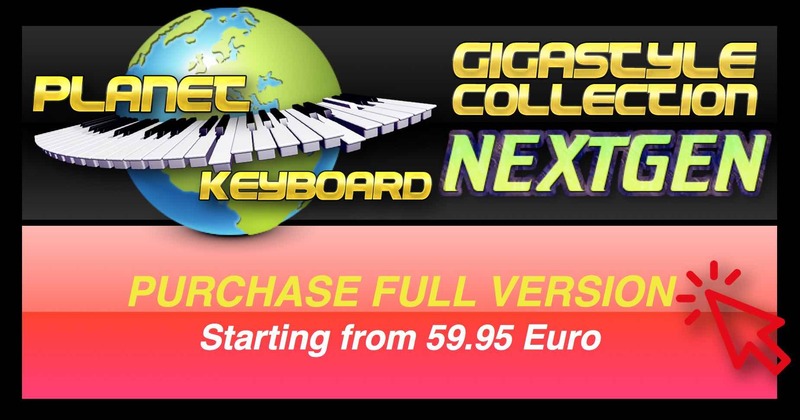 Always on the cutting edge of innovation, often copied, never matched, PlanetKeyboard & GIGASTYLECOLLECTION products are innovating and effective. 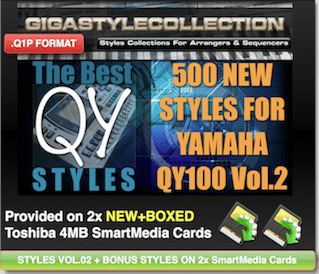 Styles for Yamaha QY100, Yamaha QY700, Casio MZ-X500 and Casio MZ-X300, styles collections with Style Player software on PC. A vast choice of exclusive products renowned worldwide which you can browse in our shop here. Our team of renowned experts answers your questions live on our website of via this form. Our support team is there for listening and supporting you. The team is very reactive and you can contact it here. Each order is dealt with great care and as fast as possible. 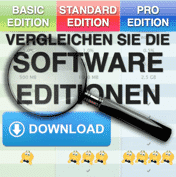 Immediate download or international express mail with tracking according to the products ordered (USB stick or memory card), no bad surprise. WORDWIDE Premiere ! The PlanetKeyboard.com team is happy to introduce NEW styles for Casio MZ-X Series & a partnership with CasioStyles.com. 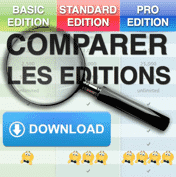 There are 4 styles volumes (16 Styles per volume). Dear visitor, welcome to PlanetKeyboard ! At PlanetKeyboard you’ll find many things to expand your musical instrument and feed your musical needs, below is a list of the products we have carefully selected for you in order to offer your keyboards new musical paths to explore. At PlanetKeyboard we have “Styles” also known as “Rhythms” or “(Auto) Accompaniments” for your arranger keyboards and modules or sequencer. BOHM – CASIO – GEM – HOHNER – KETRON – KORG – ORLA – ROLAND – SOLTON – Technics – Wersi – YAMAHA instrument. With their exclusive products called “GIGASTYLECOLLECTION with Style Player” it is bundled with a special companion Software including “Style search engine features” (for Windows). 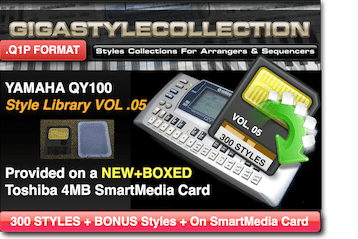 The GIGASTYLECOLLECTION “Style Player” enables you previewing the styles on your computer using a very high quality style playback synth engine before transferring them to your instrument, it also helps to save your older instrument life which may rely on fragile floppy diskette drives and save you from performing hundreds if not thousands of useless operations on your instrument panel, it is a PRECIOUS and efficient TimeSaver. 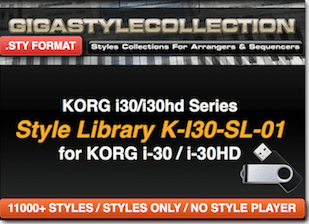 We also stock the WORLDWIDE EXCLUSIVE “Style Libraries” from GIGASTYLECOLLECTION for devices like the Yamaha QY-100 and QY-700 and KORG i-1, i-2, i-3, i-4s, i-5m, i-5s, ix-300, is-35, is-40, i-40m, is-50, i-30, i-30HD, microArranger, Havian 30, PA-50, PA-60, PA-80, PA-300, PA-500, PA-600, PA-800, PA-900, PA-1X, PA-2X, PA-3X, PA-4X /PA700 / PA1000 & more ! 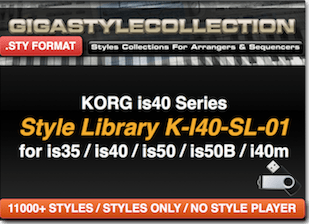 These “Style Libraries” do not come with “Style Player” software but offer you musical styles to cover nearly every possible music genres & are ready to play in your instrument. 8 beat – 12 beat – 16 beat – 30s – 40s – 50s – 60s – 6/8 – 70s – 80s – 90s – Acid Jazz – Acoustic – Afro – Ballad – Bebop – Beguine – Big Band – Bluegrass – Blues – Bolero – Boogie – Bossanova – Calypso – Chachacha – Charleston – Country – Dance – Disco – Foxtrot – Funk – Fusion – Hip Hop – House – Jazz – Latin – Mambo – March – Mazurka – Merengue – Reggae – Rhumba – Rock – Schlagger – Samba – Salsa – Shuffle – Slow – Swing – Tango – Techno – Turkish – Twist – Waltz – World Music & Many Many More ! Do you remember the Yamaha QY-70 ? 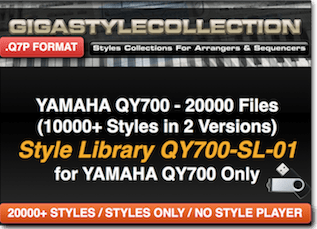 GIGASTYLECOLLECTION just released exclusively for PlanetKeyboard customers the “Yamaha QY-70 Emulator” for Yamaha QY-100. What is it ? 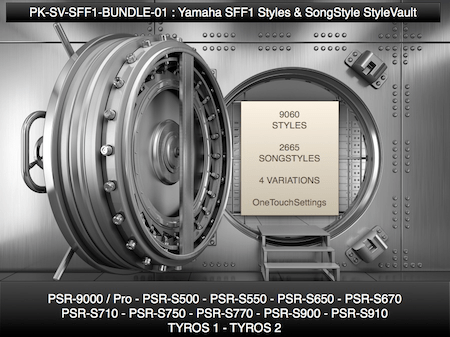 Imagine you can insert a Yamaha QY-70 inside your Yamaha QY-100 ! 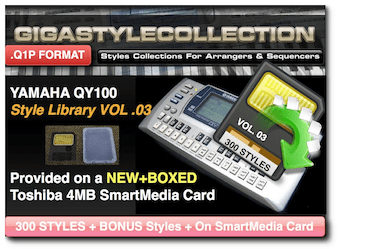 It consists of the complete “QY-70 128 Internal Styles Simulation” ported to the Yamaha QY-100 and it is provided on a Brand New (Not second hand or used) 4Mb Toshiba Smart Media Card. 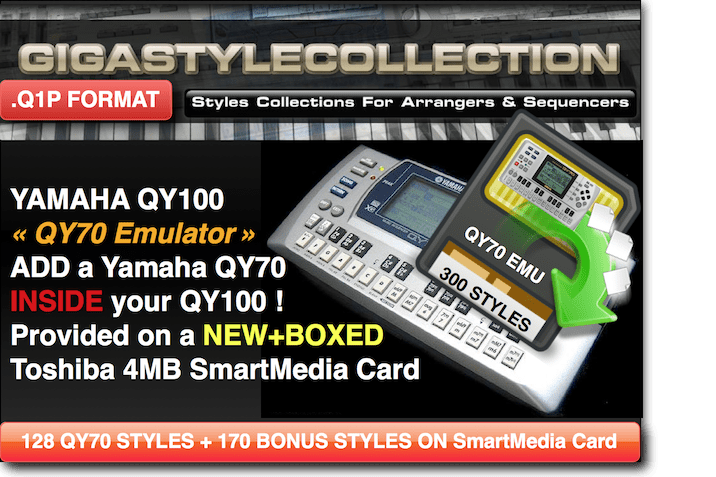 And of course we add 170 New Bonus styles with this QY-70 Emulator. 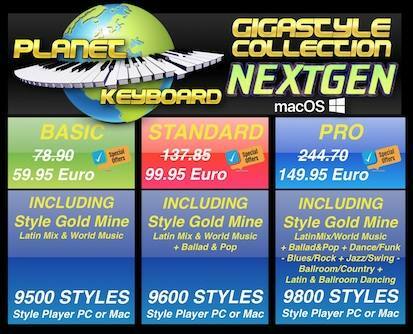 LIMITED OFFER : As a GIFT PlanetKeyboard and GIGASTYLECOLLECTION added 170 Bonus Styles to the 128 QY70 Styles. At PlanetKeyboard you will also find “Midi Patterns/Loops” for your software or hardware sequencers and midi instruments. We also have a wide range of “Very Hard to Find” Memory Cards / Expansions / Memory Cards Adapters / Memory Card Readers & Storage Solutions as well as Accessories and Goodies. You want more ? We have a “Treasure Chest” full of rare “Service Manuals & Guides” as well as “Tools” and “Spare Parts” and more to come ! We even have “Sound Samples & Sound Banks” for your synthesizer/arranger keyboard & computer and we have a few left and VERY RARE “PCM Cards” for KORG synthesizers like the legendary KORG 01W / 01RW / 01WFD / X-2 / X-3 / X-3R / 03RW / Wavestation WS-SR (SR Only) from SYNTHLEGENDS. 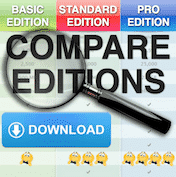 BOHM – CASIO – GEM – HOHNER – KETRON – KORG – ORLA – ROLAND – SOLTON – Technics – Wersi – YAMAHA instrument & more. You can’t find something for your instrument ? We have solutions for your needs, we have goodies for your instrument too. Drop us an email in the contact section and we will be glad to get back to you.